Chocolate Guiness Cupcakes – Voila! If only all beers came in cupcake form. No matter how many times I try James’ beer – I just can’t get into it. However, I can definitely get into these cupcakes. The beer compliments and enhances the chocolate flavor. Guinness + chocolatey baked goods = bliss. These cupcakes are moist, fluffy and rich with intense chocolate flavor. So it take it from a beer nonenthusiast: these cupcakes rock. Preheat oven to 350 degreee. Grease or line muffin tin. 1. Melt butter in microwave, set aside. 2. In a large bowl, whisk together eggs and yogurt. Add beer and vanilla whisk until well combined. 4. Add about a third of the flour mixture into the wet ingredients and using a hand mixer, blend well. Add the rest of the flour mixture, a third at a time, mixing well after each addition. When all ingredients are blended, add the melted butter then continue mixing until very well combined. 5. Pour batter into the twelve cups, filling each about 3/4 full. 6. Bake for approximately 20- 25 minutes. Let cool for 10 minutes in muffin tin, then remove and let cool completely before frosting. 1. In a small saucepan, whisk flour into milk and heat, stirring constantly, until it thickens. Remove from heat and let it cool to room temperature. (To expedite the process, place the saucepan over bowl of ice water for about 10 minutes or so until the mixture cools.) Stir in vanilla. 2. While the mixture is cooling, cream the butter and sugar together until light and fluffy. Then add the cooled milk mixture and beat until it all combines and resembles whipped cream. 3. Spread onto cupcakes. Decorate. Eat! 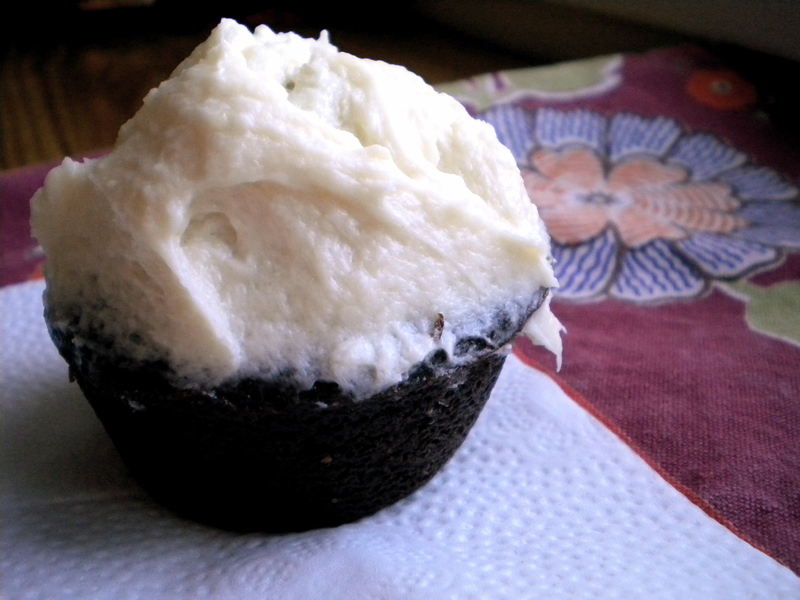 Pingback: Chocolate Kahlua Cupcakes « Voila!